Known seaside resort on the Riviera located less than 70km from the French border. Sandy beach very end of a little less than 4km. In the city center the 'budello': long narrow street parallel to the sea that winds between houses of the 16th and 17th century and modern shops. Elegant center of the Riviera surrounded by green areas and villas on the hill. Ideal for children. The apartment has a private parking and is located in a ground floor on high (2.50m) is sunny and close to the sea (400m) and the city center (400m) .We can do without car to go to the beach or shopping. The apartment is on the ground floor but on an elevated plane approximately 2.50m. So na no balcony but it has a closed car park and adjacent to the apartment. It is ideal for 5 or 6 people. Everything is available nearby grocery stores, restaurants, supermarkets are within walking distance. The beach and the city center are within 500 meters. The apartment is conveniently located and there is no need to take the car to go shopping, bathing or eating. 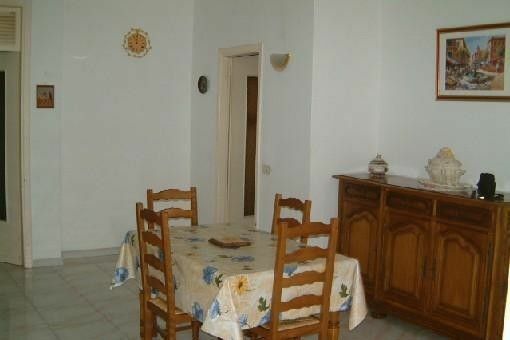 A spacious and clean appartment in the well known seaside resort. One should consider that the appartment is located in a busy town, which is not the most quiet place to have a holliday. L'appartement n'est pas sombre mais au contraire lumineux, s'il fait soleil naturellement. Alassio est en effet une ville très vivante et donc assez bruyante surtout quand on est près du centre. Il faut donc aller sur les hauteurs pour avoir du calme et donc prendre la voiture pour aller à la mer. Je m'étonne de cette appréciation car la locataire est déjà venue et connaissait donc les lieux. I consumi sono compresi sul prezzo proposto.La biancheria da camera, da bagno non sono fornite.Eventuali la seconda e la terza settimana saranno scontate in modo progressivo salvo in agosto.No deposito cauzionale.